With five branches scattered across London, I was gobsmacked to have missed out on the phenomenon that is Vagabond Wines for so long. The concept is simple, but revolutionary for wine lovers. On arrival, you will be handed an electronic card, similar to an Oyster card used for travelling across London’s tube network. You will then have the option to load as much money onto it as you wish and will also have to pay a £5 deposit for the card. Here’s where the fun comes in. Each Vagabond Wines branch houses hundreds of wines, but with a twist. 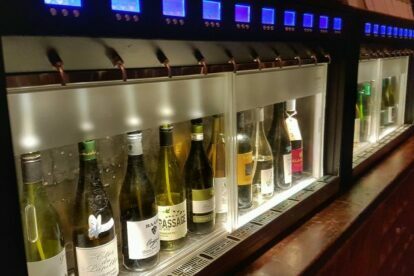 Each bottle is kept behind glass and you can browse the shop with a large wine glass and pick and choose your wine, paying for it with your top-up card. I can only describe it as much like a pay-by-the-glass wine vending machine. There is of course huge variety between the quality and types of wines – but luckily there is a taster option to avoid shelling out on a large glass of the wrong wine! I personally have visited the Clapham Junction Northcote Road branch and central London’s Charlotte Street store. Both were a real treat to visit – rustic, cosy and buzzing with the excitement of the novelty of it all. As you can imagine, these heavenly spots get very busy so I would definitely recommend booking a table in advance. Pair your selections with cheeseboard and you’re doing it right.